These are heavenly. The sweet tahini drizzle is just so incredibly delicious with the soft spiced carrots and crunch toasted pistachios. Preheat oven to 200’C. Combine the spices and salt in a bowl. Wash and peel your carrots and lay them out on a roasting tray. Drizzle the olive oil over the carrots and toss them to coat evenly. Sprinkle the spices generously over the carrots then toss. Roast at 200’C for 35-40 minutes until tender. While they’re roasting, toast the pistachios in a pan on medium heat for a few minutes until golden. When they have cooled, roughly chop them and set them aside. Roughly chop the coriander too. Mince the garlic and add it to a small bowl with the tahini, balsamic vinegar and honey. Whisk it all together well until you have a thick smooth sauce. 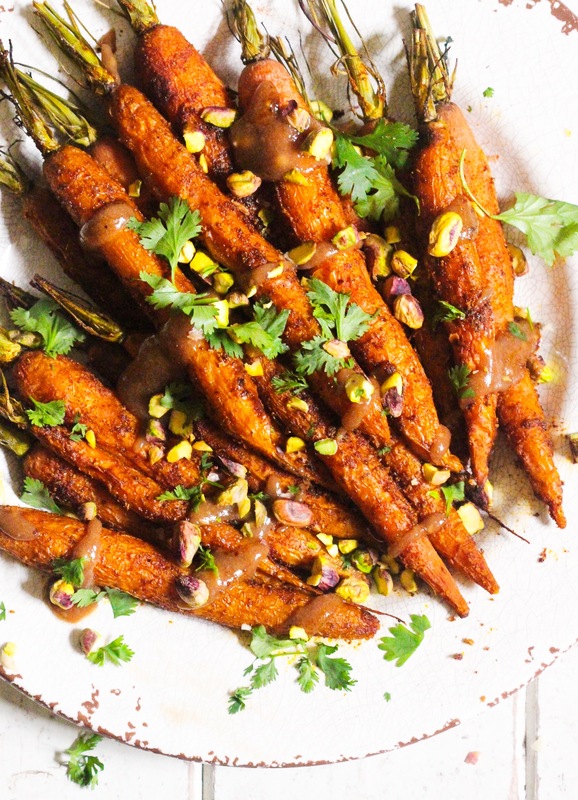 Plate the carrots, drizzle on the sauce and sprinkle with the toasted pistachios and coriander.